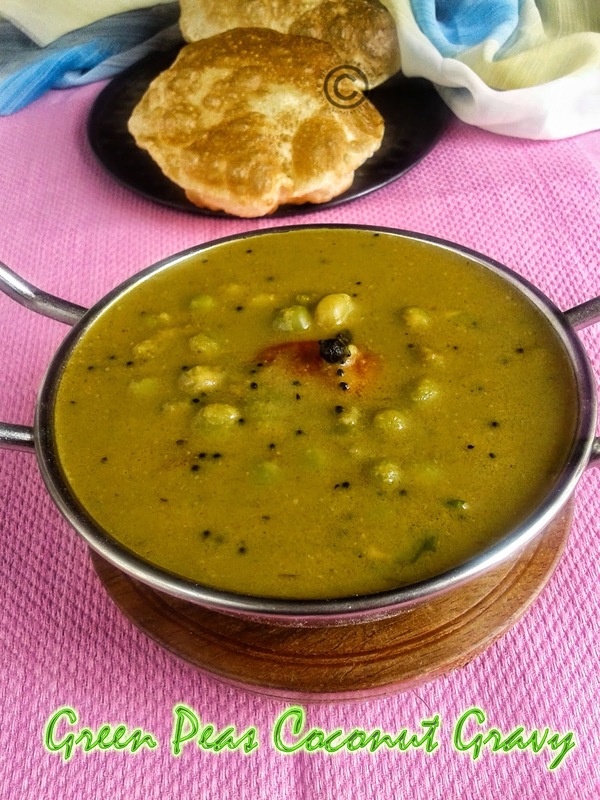 Green peas are my favorite, even I don’t hesitate to intake daily. Fresh peas are most favorite than dried peas, but it will available on seasons. Making side dish for chapathi or paratha is always thinking job, I always prefer to make different types of gravies every time. 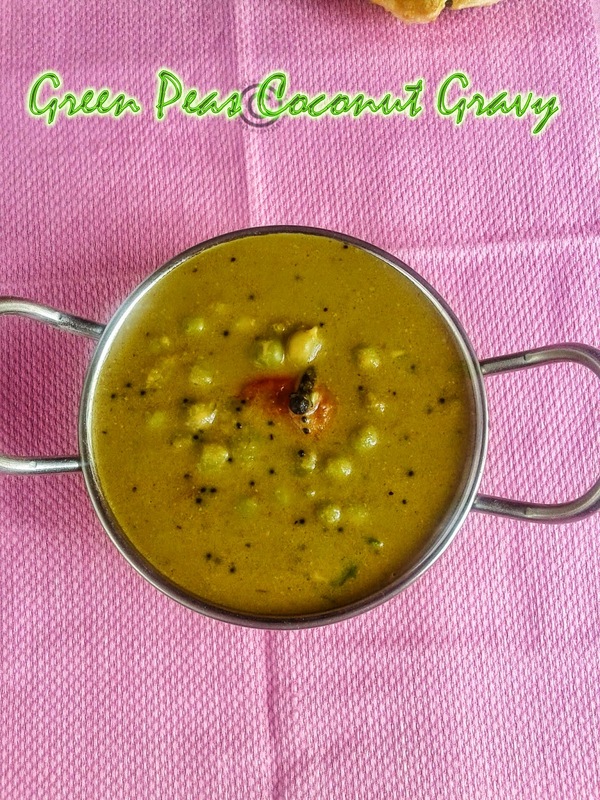 Especially I love restaurant green peas curry, soon will make with fresh peas and share. This time I have tried Kerala cuisine. 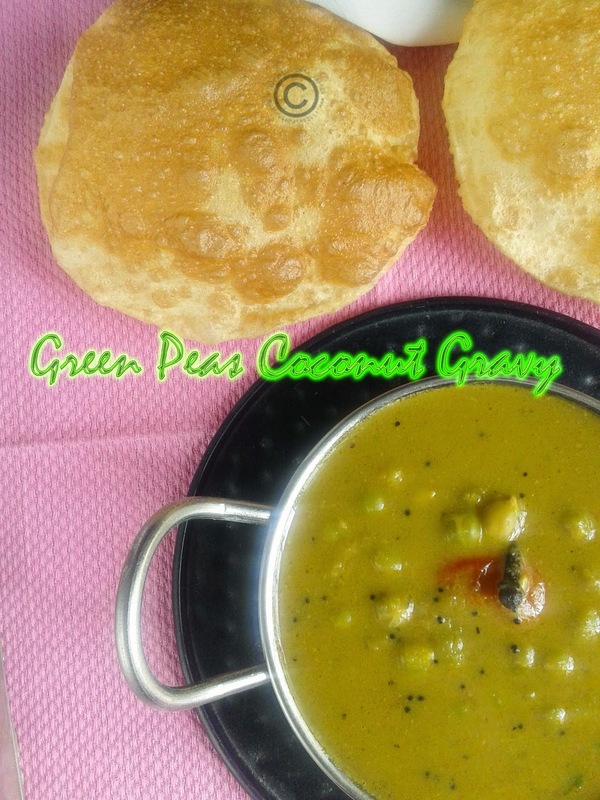 Soak the green peas atleast 4-6 hours or overnight. 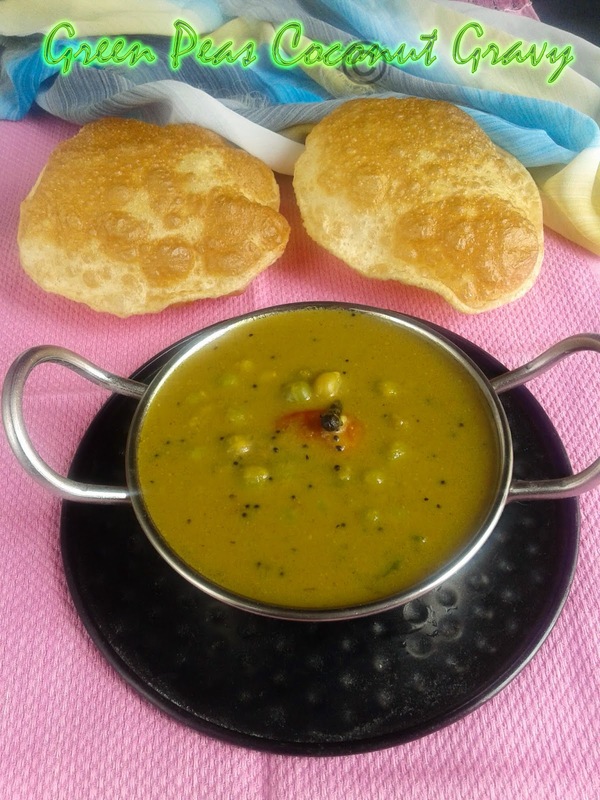 Pressure cook the peas with 4 cups of water with little salt upto 4 whistles. Meanwhile, add 2 Tsp oil in pan; add shallots sauté it for 2 minutes and then add ginger garlic paste, green chillies sauté it till the raw smell goes off. Then add turmeric powder and coriander powder sauté it for other one minute and switch off the flame. Cool it completely and grind into smooth paste with little water or stock. In the same pan, add 1 Tbsp oil following by add cinnamon, cloves and cardamom. And then add mustard and urad dal wait for sputter. Add tomatoes and sauté it till mushy and then pour ground masala, fennel seed powder and salt sauté it for 2 minute or oil oozes out from the mixture. Add the green peas stock to the mixture and allow boiling on medium flame for 5 minutes. 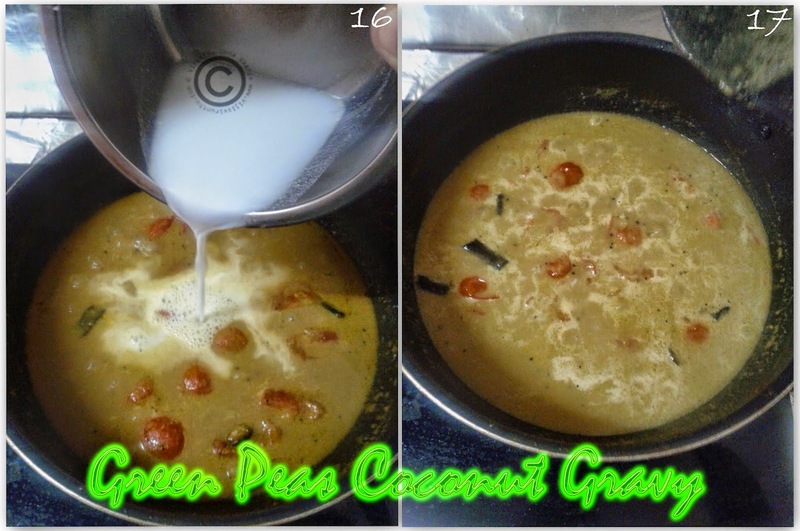 Now add green peas and coconut milk to the gravy, mix it well and allow cooking for other 3 minutes. Switch off the flame and add coriander leaves. You can use fresh peas instead of dried one, or can use any other lentils. Use fresh coconut milk to get unique flavour. If you don’t have shallots replace with onions. I forgot to sauté tomatoes, so I added in the gravy in-between. 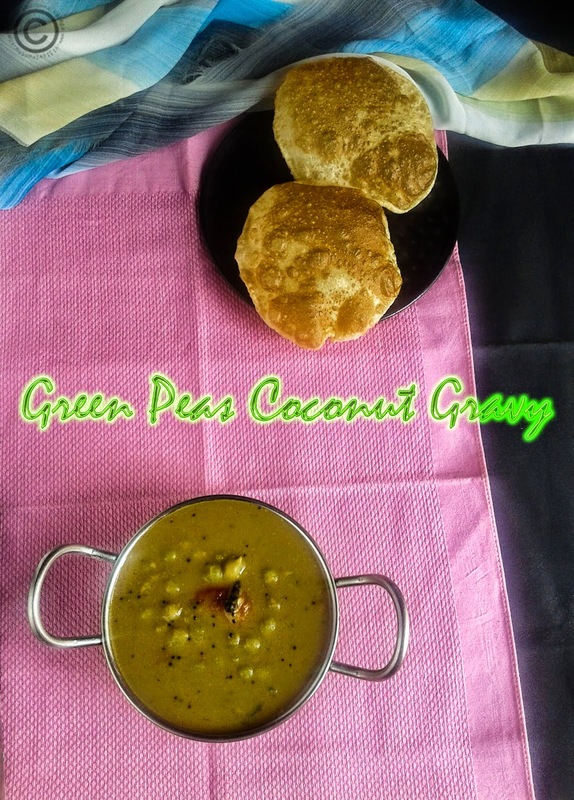 Interested in other side dish recipes of green peas??? Healthy dish.. perfect with roti and rice.. Nice clicks..